If you’re looking for something new and exciting to play this weekend, look no further than Colorbox’s new game app, Tale of the Zodiac. A dark power has stolen the members of the Zodiac, and you must be the one that retrieves them from 12 different locations across the land (as well as a hidden thirteenth Zodiac member). The setup of Tale of the Zodiac is nearly identical to a match-three bottom shooter game, with one major difference: instead of trying to match a number of the same color together, you’re trying to get rid of falling objects by mixing the primary colors (red, green, and blue) together to make up the color of the falling circles. Tap on the shooter to change colors, and then tap somewhere on the screen to shoot in that direction. If you hold while tapping, the trajectory of the shot will appear, which you can use to bounce the beam off of the walls. 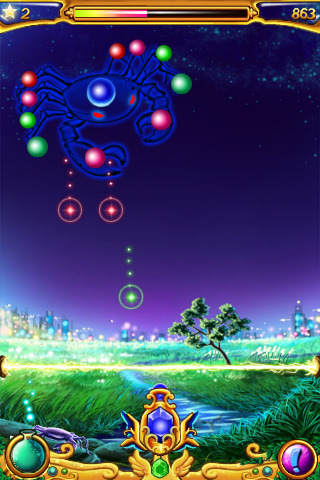 Each time you clear a color sphere, your health bar gets a boost; once your health bar fills up, you move on to the next level (each location holds 10 levels). Clearing all the levels means you get a boss-match facedown (inexplicably, the take on the shape of whatever Zodiac you’re trying to rescue). All locations are locked until you finish the levels of the previous one, and each location gets faster and more congested with color spheres. Other falling objects you must note are Power-Ups and Elements. Some Elements can bend your beam, while some release stars–be sure to catch the stars as they are released from the sphere that holds them to gain new items in the Shop. Power-Ups can increase health, affect the speed of the falling objects, or change their colors. There are three difficulty levels: Normal mode lets you see the color breakdown of each sphere, so you’ll always know which colors need to be shot. However, the other modes don’t allow this luxury–you must remember which colors to mix. What makes Tale of the Zodiac great is that it incorporates a little bit of everything: adventure, color matching, shooting, shopping, and collecting. The gameplay is solid, and as the highlight of the entire game is color mixing, the graphics are gorgeous and vibrant (but what’s with the half-naked shopkeeper?). The landscapes alone are awe-inducing. The one the best aspects of Tale of the Zodiac, however, is the soundtrack. You can’t have a good adventure/story-based game without a decent soundtrack, and this is where Tale of the Zodiac knocks it out of the park. It’s epic, but fun, which fits the game completely. Perhaps some additions should be a Rush/Survival mode for quick in-between-moments games, or the option of separate player profiles, so other people can enjoy the game without messing up my own progress. The game is available for the introductory price of $0.99, which is a steal, considering the level of quality you’re getting. AppSafari review of Tale of the Zodiac was written by Julie Guan on July 5th, 2010 and categorized under Adventure, App Store, Fun, Games, Puzzler. Page viewed 3851 times, 2 so far today. Need help on using these apps? Please read the Help Page.